As legal marijuana sales continue to explode (it's estimated to quadruple in the U.S. between 2016 and 2021), growers face mounting challenges along with enticing profits. Complaints about cannabis odour have jumped in some areas by as much as 87 per cent since growing became legal. In Denver alone, 30 per cent of all municipal odour complaints are now cannabis-related. Local governments and clean air agencies are starting to enact laws and issue fines — in the tens of thousands of dollars — to limit odors. Many odor control solutions require complex engineering, expensive permitting, or costly equipment. One option that is gaining interest is plant-based odor removers, a cost-effective and more earth-friendly way to get rid of cannabis smells. The strong odours produced by growing cannabis are often described as pungent, skunky, floral, fruity, or even "sewer-like." Created by the plant's essential oils (terpenes), odours are strongest when the flower is budding. Some odors from cannabis farms have been detected more than a mile from their source. Cannabis odour is a complex mixture of chemicals. The "scent" usually comes from the terpenoids and terpenes that it contains. Terpenoids can be further classified into monterpenoids, sesquiterpenoids, diterpenoids, and triterpenoids. They can be acyclic, monocyclic, or polycyclic hydrocarbons that may have substitutions on them including alcohols, aldehydes, ethers, ketones and esters. A mixture of general hydrocarbons also play a role in the odour. The concentration and combination of odorous chemicals vary from greenhouse to greenhouse. Hundreds of different strains of cannabis can be grown, each with a unique scent profile. Over 200 individual compounds have been identified as terpenoids, making the chemical makeup of odours complex. Because smells and their chemistry can vary, it can be difficult to find an odour solution that works for every grower and every facility. There are several commonly used techniques currently in place to remove odours in cannabis growing facilities. While there are viable options, each come with a variety of limitations and their own shortcomings. Most cannabis greenhouses use carbon filters to remove odours permeating from the facility. Activated carbon works by the contaminated air stream passing through the activated carbon. Carbon is porous, has a large surface area, which allows the carbon to absorb the odorous chemicals in the air stream. Wet scrubbers treat contaminated air by pumping it into an aqueous solution before it escapes outside. The odorous compounds go into the liquid and chemically react with the solution, removing odours. If mercaptans or ammonia is present in the air, a multistage scrubber is sometimes used. In biofiltration, contaminated air passes through soil, compost, wood chips, or other organic material. As the odorous air flows through the material, pollutants (including odour molecules) transfer into a thin biofilm on its surface. Micro-organisms are immobilized in the biofilm and eliminate odours. Masking agents are chemicals sprayed into the air to cover up produced odours. Masking agents use fragrances to "hide" odours and are used outside greenhouse facilities so they do not impact the taste or smell of actual cannabis plants. They often work by adhering to the outside of odour molecules. Activated carbon filters work well on sulfur-containing compounds, but it is not as effective at treating nitrogen-based compounds. They also must be replaced about every year, which can be costly and time consuming in larger facilities. Also, carbon filters reduce airflow through greenhouse fans. Since airflow is so important to growing, additional fans are sometimes needed. Biofiltration works on odours that are both biodegradable and water-soluble, including hydrogen sulfide and other sulfur-containing compounds. They do not work effectively on chemicals containing nitrogen. In order for the microbes to interact with the odorous compounds, they must be present in them for long periods. To scrub large amounts of odorous air, a sizable amount of material and a massive footprint are often needed. While masking agents give an immediate cover to odours, they will eventually return. After a short period, the fragrance and odour molecules separate, leaving the odour behind. 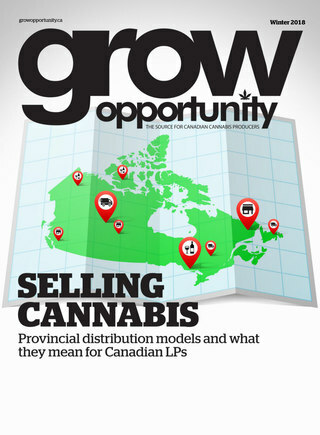 ● Most municipalities now restrict how commercial cannabis grow operations handle odours. ● Large-scale ventilation systems that pump untreated air outdoors can be prohibited in some urban areas. ● Industrial filtration systems can be costly to install, operate and maintain. Plant-based odour removers use natural plant oils to destroy cannabis smells. The blend of plant oils attract odour molecules, and use adsorption and absorption reactions to neutralize their offensive scents. These liquid products are distributed by systems placed where exhaust exits in a growing facility, eliminating odours before they become a nuisance to neighbours. There's a saying in chemistry that "like dissolves like." A more common version of this saying is "fighting fire with fire." Natural odour removers use plant oils to neutralize plant odours. As an example, alpha-pinene is a volatile organic compound (VOC) that is a terpene — an odour-causing compound in cannabis. Alpha-pinene is present in other plants, including Pine, Rosemary, Frankincense, Cypress, Juniper Berry, and Orange. Some of these oils are effective at attracting and neutralizing odour molecules from cannabis, because of their similar chemical makeup. Using this knowledge, natural odour removers can be specifically designed to eliminate the odorous chemical compounds in cannabis — including cannabinoids, terpenes, and sesquiterpenes. Since a blend can be engineered for broad-spectrum odour control (it can remove a larger range of odorous compounds), it works better and more universally than other methods. Plant-based odour removers do not contain harsh chemicals or synthetic fragrances. Because they are non-toxic, non-hazardous, biodegradable, non-flammable, and contain no harmful VOCs, they are safe to use around people and require no permits to use. Delivery often needs no added water, thanks to advanced Vapor Phase technology, making it cost effective and more eco-friendly. And they are used outside greenhouses so they do not come into contact or alter the plant itself. Most products come in concentrated liquid. They can be delivered through misting systems at exhaust vents, vapor ducting at the top, or other areas of a greenhouse. Another advantage of natural odour removers is their flexibility. Complete solutions can be customized to every facility to combat any odour issue. Dr. Laura Haupert is director of research and development at OMI Industries, manufacturer of natural industrial odour removers. Her team uses simple chemistry to identify odours and develop safe, plant-based solutions for many markets and odours. To learn more about plant-based odor solutions for cannabis, visit odormanagement.com/cannabis. Do you know a great grower?